HAVE YOU ALWAYS WANTED TO MAKE YOUR OWN CHRISTMAS WREATH? FEELING THE URGE TO CHANNEL YOUR INNER KIRSTY ALLSOP? WANT TO GET CRAFTY THIS CHRISTMAS? Hibiscus Room in Hereford. 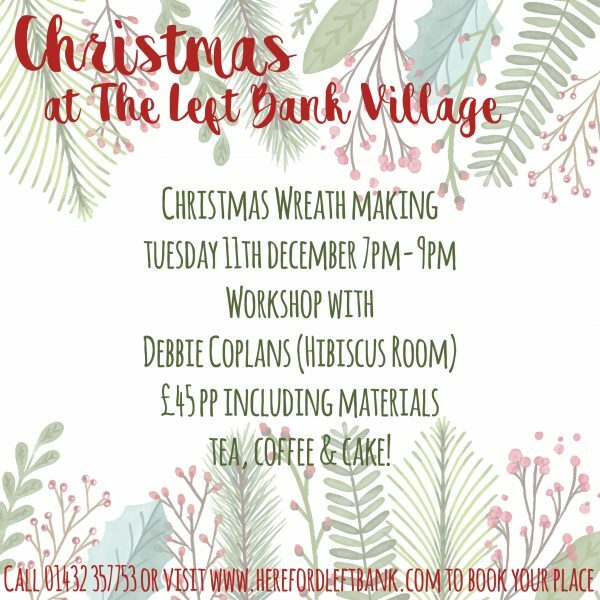 Debbie will show you how to put together the most fabulous Christmas decorations (while making it look terribly simple! ), all in the comfort of the cosy, warm and festively decorated De Koffie Pot. Why not get a group of friends together for a bit of a pre-Christmas get together and maybe stay for a glass of mulled wine afterwards! Tickets are £45pp and include all of your materials, bottomless Tea & Coffee and a selection of delicious De Koffie Pot cakes to keep you going! Spaces are limited so make sure you book yours early.